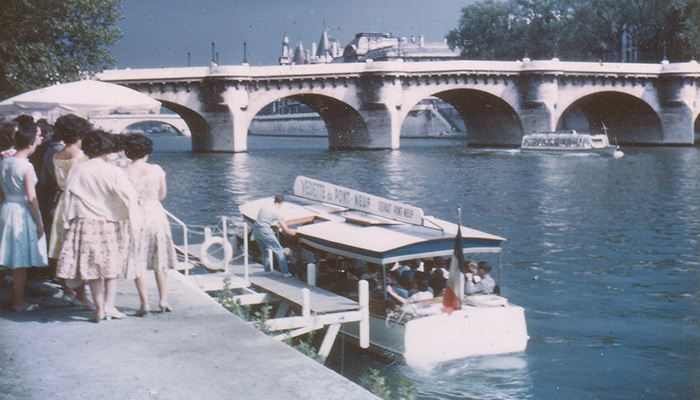 Les Vedettes du Pont Neuf are created in 1959 by its founder Emile Azam. After having been a dealer in the 50s, a brand of boat building (Rocca) on the banks of the Marne at La Varenne Saint-Hilaire, he embarks on an adventure in Paris. The first Parisian implantation takes place in front of the Louvre, Quai du Louvre, on the right bank of the Seine. The first boat is in wood and called Symoun, with a capacity of 30 seats. The cruises take place from April to September, and last 30 minutes without comments. The construction of a first boat made of steel with 50 seats is launched in 1960 in Concarneau: the Rocca I. Soon, Emile Azam realizes that it is already proving too small. Thus, in 1962, a new Vedette with 112 seats is delivered by the Chantiers de Concarneau, called Rocca 2. In 1964, Rocca is sold to finance the construction of the Rocca 3 and 4. The move became necessary for the realisation of the Georges Pompidou expressway. A 25m pier is then built in Concarneau to receive the three ships of the fleet. In 1970, Emile Azam calls his 16 year old nephew sides, Eric Levavasseur. The Rocca 5 joins the fleet of existing boats. Eric asks his brother Xavier Levavasseur to join in 1977. Attendance is steadily increasing. In 1980, the Hydraseine, a boat with 250 seats, is built by Chantiers Trait, near Rouen. This new larger boat allows evening events (150 to 200 per year). The 25m pier is too small; in 1982 the surface is doubled and hosts a bar. Meanwhile, theme cruises and lunch cruises in restaurants along the Marne are offered to customers and more than 10,000 passengers are responding favorably in a year. With the development of these new products, the acquisition of a new boat with 150 seats, is indispensable: the Vert Galant, bought in 1985. Attendance is still increasing and the company decides to build in 1989, on the occasion of the bi-centenary of the Revolution, a 350 seats boat, called Europa, built by Chantiers de la Haute Seine Villeneuve le Roi. Tastes change and customers demand the sun: a terrace is built on the roof of the Hydraseine to also increase its capacity from 250 to 350 seats. The company sells the Rocca 3, Rocca 4 and 5 are moved to the Port of Nogent sur Marne. 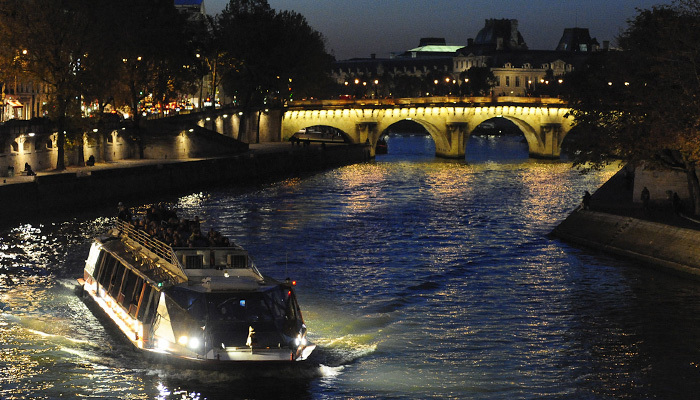 A new 550 seats boat, called the Parisis and built by Chantiers de la Haute Seine, starts operating in spring 1994. Les Vedettes du Pont Neuf then have a capacity of 1250 seats/ hour. The company faces competition of restaurants boats, and decides to invest in kitchens on board the boat Vert Galant. 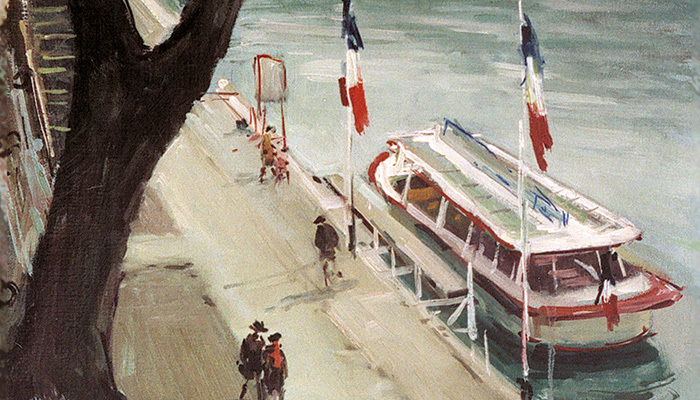 Sales continue to grow and a new company is created: Les Croisières du Pont Neuf emerge. This new structure increases the commercial team essential to this new development. The results are immediate: 15,000 meals are served in the first year of operation. In this year 1998, it is clear that requests for receptions and events can not be met. Another site is indispensable. In addition, the tourism in Paris is growing: coaches are more likely to converge to the major tourist sites, close to the heart of the city. Traffic and parking becoming increasingly difficult, the city takes restrictive measures. The coach park of Bercy, the largest in Europe was born, alongside the Palais Omnisports and later Bercy Village. We are witnessing the beginning of the outbreak of eastern Paris. The company takes the plunge and keeps investing. In 1999, Marina de Bercy is created. The company Bercy Navigation is created in association with Luc Devillers for the construction of a new 250 seats restaurant boat, the Grand Pavois, and a 60m pier. The boat has a modern and revolutionary design. The pier has a bar, a conference room, a terrace of 200 seats and a large parking. 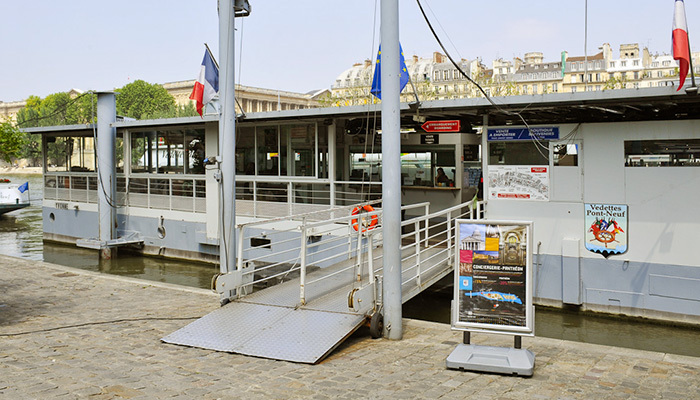 The Vert Galant, restaurant boat already operating in Pont-Neuf, joins the Port of Bercy. The Rocca 4 boat also joins the fleet to best meet the demand. Alas, this year 1999 remains a sad year as the patriarch and founder Emile Azam passes away. A page of history of Les Vedettes du Pont Neuf is turned. His nephew Eric Levavasseur is elected President of the Board, Xavier, his brother seconds him. The company remains in the family, as it has always been, without external participation: brothers, sisters, parents, uncles and aunts share the ownership of the company. Alongside, a strong and durable team, with a ‘home’ spirit. The adventure continues. Works are made and the pier of the port of Pont-Neuf is expanding and totally renovated in late 1999 early 2000. To ensure the best commercial development, Bercy Navigation which operates Marina de Bercy, opens its capital to Divercity / Cityrama group, world leader in “sightseeing bus”. The association between the two groups creates new products of combined visits in Paris. At the end of 2007, Les Vedettes du Pont Neuf buy Canauxrama, a company with 25 years of experience in the Paris canals, Marne, Oise and Seine. Four new boats adapted to the canal and the river, with great potential for Les Vedettes Pont Neuf. 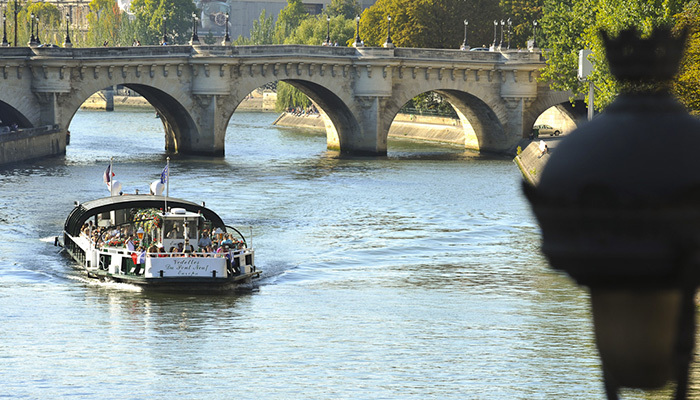 Simultaneously, Les Vedettes du Pont Neuf get involved in the implementation of a boat company in Rome, with the city of Rome willing to start cruises on the Tiber. The boat company Battelli di Roma is founded in April 2003 and currently operates six boats on the Tiber. As part of a European business development, commercial agreements are concluded between three boat companies: London with City Cruises, London’s biggest company in Paris with Les Vedettes du Pont Neuf and Rome with Battelli di Roma. More than fifty years have passed. Tourism has grown steadily. The banks of the Seine are classified World Heritage by UNESCO. Bridges lit up, Paris reinforced its image of city of light. Les Vedettes du Pont Neuf have continued to invest. The company has developed and is now structured, its future is flourishing.